Modelling the real world is a very real challenge. Relying upon any real world model is inherently risky because mathematical models can be more magical than meaningful. This is especially true in the Earth Sciences. Establishing whether a mathematical model is realistic or surrealistic is a very necessary precaution before making any future forecasts. Just ask the Intergovernmental Panel on Climate Change! This post was edited a little by Andy May, who believes the only safe prediction is that the predictions of “consensus scientists” will continue to be wrong. Establishing whether a model is realistic or surrealistic is especially necessary before making any historical hindcasts. The problem with historical hindcasts is that they become unverifiable when detailed observational information is no longer available in the historical archives. Did it really take 200 years for maize production to “take off” in Europe? Does the mainstream have a modelling problem? … pollen from the plants, trees and crops growing in Western Europe were being swept up by the winds and carried toward the Alps. They became trapped in snowflakes and fell onto the region’s highest mountain, the Monte Rosa massif. Historical records tell us that Columbus introduced maize to Europe in 1493, but maize pollen doesn’t show up in the ice core until the mid-1700s, a sign that its large-scale regional production didn’t take off immediately. The Monte Rosa is a mountain massif located in the eastern part of the Pennine Alps. It is located between Switzerland (Valais) and Italy (Piedmont and Aosta Valley). 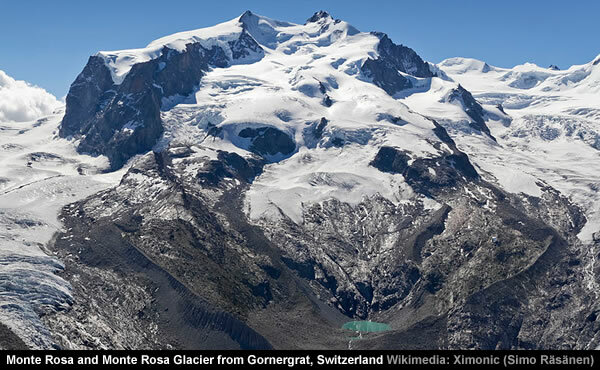 Monte Rosa is the second highest mountain in the Alps and western Europe. 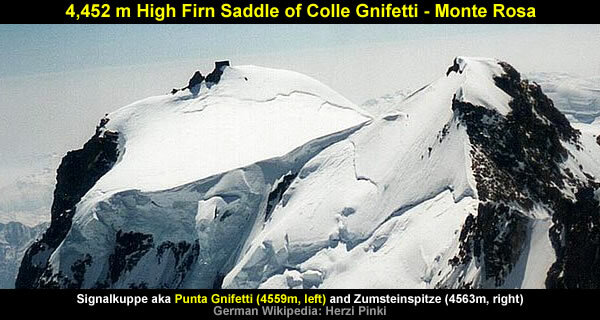 The Signalkuppe also known as Punta Gnifetti (4,554 m) is a peak in the Pennine Alps on the border between Italy and Switzerland. It is a subpeak of Monte Rosa. An excellent chronology can often be established for the “most recent 200 years” of an ice core because the chronology can be verified by referencing historical events such as volcanic eruptions. Ice cores usually provide excellent chronologies and high temporal resolution records, especially for the most recent 200 years where age-depth models can rely on absolutely-dated reference horizons (e.g. volcanic layers) and annual layer counting (e.g. Preunkert and others, 2003; Olivier and others, 2006; Jenk and others, 2009; Sigl and others, 2009; Herren and others, 2013; Konrad and others, 2013). One crucial condition for the interpretation of ice-core records is the establishment of an accurate time-scale. This task is especially difficult for glacier sites in a complex topography such as the Alps, due to the often irregular deposition of fresh precipitation. More specifically, the chronology for the Colle Gnifetti CG03 Ice Core – which hit bedrock at 80.20 metres – was verified down to 53.52 metres by the Laki eruption of 1783/4. Two 82 m long ice cores (CG03A, CG03B) from the European Alps, which are surrounded by highly-industrialized countries (e.g., Germany, Italy, France) representing some of the main emitters of 19th to 21st century fossil-fuel industrial BC (Bond et al., 2007) were drilled in 2003 a meter apart on Colle Gnifetti (Monte Rosa, 4450 m a.s.l., 45°55’55”N; 07°52 ’ 34”E , (Jenk et al., 2009)). Additional firn/ice cores (CG08, CG15) were obtained from the same site at Colle Gnifetti in 2008 (Kirchgeorg et al., 2013) and in September 2015, respectively, to update the long-term record to the most recent past. Laki or Lakagígar (Craters of Laki) is a volcanic fissure in the south of Iceland, not far from the volcanic fissure of Eldgjá and the small village of Kirkjubæjarklaustur. The system erupted violently over an eight-month period between June 1783 and February 1784 from the Laki fissure and the adjoining volcano Grímsvötn, pouring out an estimated 42 billion tons 14 km3 (3.4 cu mi) of basalt lava and clouds of poisonous hydrofluoric acid and sulfur dioxide compounds that contaminated the soil, leading to the death of over 50% of Iceland’s livestock population, and the destruction of the vast majority of all crops. This led to a famine which then killed approximately 25% of the island’s human population. The lava flows also destroyed 20 villages. The Laki eruption and its aftermath caused a drop in global temperatures, as 120 million tons of sulfur dioxide was spewed into the Northern Hemisphere. This caused crop failures in Europe and may have caused droughts in North Africa and India. Dating the CG03 Ice Core beyond 1783/4 relies upon the creative use of settled science and modelling. 3rd order polynomial projections [based upon the verified data] indicates the base of the Colle Gnifetti CG03 Ice Core is dated to between 1660 and 1690. These straightforward statistical projections go a long way towards explaining why it’s said “maize pollen doesn’t show up in the ice core until the mid-1700s”. Unsurprisingly, this period of time is associated with a significant downward spike in temperatures. Arguably, this significant downward spike in temperatures was triggered by the dust and debris left behind by the sungrazing Great Comet of 1680 and Comet Halley in 1682. C/1680 V1, also called the Great Comet of 1680, Kirch’s Comet, and Newton’s Comet, has the distinction of being the first comet discovered by telescope. 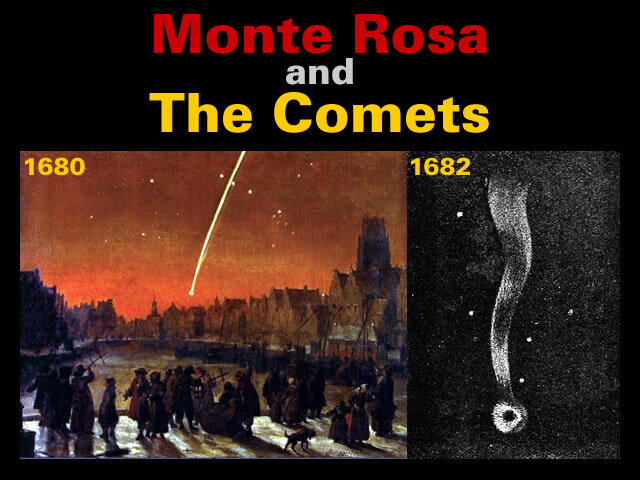 The comet was discovered by Gottfried Kirch on 14 November 1680, New Style, and became one of the brightest comets of the 17th century – reputedly visible even in daytime – and was noted for its spectacularly long tail. Passing 0.42 AUs from Earth on 30 November 1680, it sped around an extremely close perihelion of 0.0062 AU (930,000 km; 580,000 mi) on 18 December 1680, reaching its peak brightness on 29 December as it swung outwards. It was last observed on 19 March 1681. Halley’s Comet or Comet Halley, officially designated 1P/Halley, is a short-period comet visible from Earth every 74–79 years. Halley’s periodic returns have been subject to scientific investigation since the 16th century. The three apparitions from 1531 to 1682 were noted by Edmond Halley, enabling him to predict its 1759 return. A sungrazing comet is a comet that passes extremely close to the Sun at perihelion – sometimes within a few thousand kilometres of the Sun’s surface. Although small sungrazers can completely evaporate during such a close approach to the Sun, larger sungrazers can survive many perihelion passages. However, the strong evaporation and tidal forces they experience often lead to their fragmentation. Two light-to-dark sequences of brown-reddish “insoluble particles” at the base the Colle Gnifetti CG03 Ice Core supports the view that cometary dust in 1680 and 1682 triggered the significant downward spike in temperatures that facilitated the accumulation of snow and ice in Colle Gnifetti. The mainstream associate these brown-reddish “insoluble particles” with “Saharan dust events”. The insoluble particles from the Colle Gnifetti ice core reveal a brown-reddish color, typical of the Saharan dust events [Krueger et al., 2004]. Moreover, the crystalline mineral record exhibits the same pattern of variations as the total aerosol record, suggesting Saharan dust as major component of total aerosol mass. Indeed, the mean diameter of the minerals within the largest dust outbreaks preserved in the Colle Gnifetti ice core range between approximately 2 and 4 mm (mean of 1.31 mm over the entire record), which matches variations in Saharan dust particle size transported to the Colle Gnifetti site over the last decades [Wagenbach and Geis, 1989; Schwikowski et al., 1995]. Perhaps it’s time for the mainstream to consider cometary contributions being responsible for these brown-reddish “insoluble particles” and the [unexplained] Saharan sands. Gallery | This entry was posted in Atmospheric Science, Comets, Glaciology, History, Iceland, Monte Rosa - Colle Gnifetti, Old Japanese Cedar Tree, Science. Bookmark the permalink. 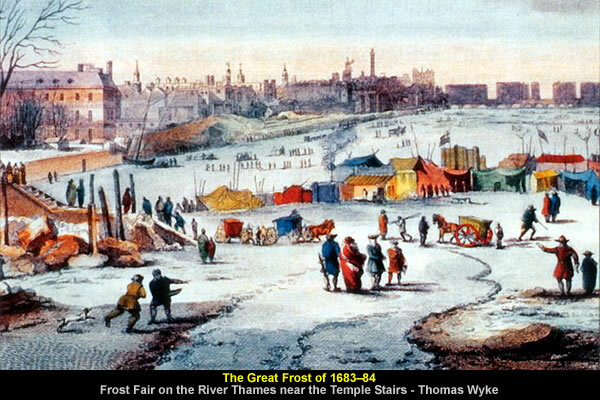 During the Great Frost of 1683–84, the worst frost recorded in England, the Thames was completely frozen for two months, with the ice reaching a thickness of 11 inches (28 cm) in London. Solid ice was reported extending for miles off the coasts of the southern North Sea (England, France and the Low Countries), causing severe problems for shipping and preventing the use of many harbours. Near Manchester, the ground was frozen to 27 inches (69 cm), in Somerset, to more than 4 feet (1.2 m).